I’ve been following J. Brown for a few years now, inspired and impressed by the consistent and constant magnifying glass he applies to the yoga world. J. has no qualms about challenging the accepted flow with his articles, calling into question elements of yoga teaching and practice that he finds problematic. But then, J. Brown is an upstart who has always gone against the grain right from the beginning of his career, deliberately taking a different approach from the yoga mainstream. “When I started in yoga, studios were all about hot classes, vinyasa, ashtanga or any of several different rigorous and difficult forms. I began to see that there were people being badly injured and teachers without proper understanding simply parroting pre-digested ideas about yoga rather than exploring it deeply for themselves. It’s why images of J. practicing yoga are casual, relaxed and effortless. He’s often wearing jeans, showing up on a city street, or on a grassy lawn. He might go against the grain and attract a fair number of detractors, but what J. is doing works. He runs a yoga center in Brooklyn called Abhyasa Yoga Center with a packed schedule and sold out teacher trainings. He’s invited to teach around the world, including at Kripalu and the Omega Centre plus he quietly put out a DVD earlier this year, simply called J. Brown’s Yoga DVD. We reviewed it here on The Yoga Lunchbox because it promised something different than many yoga DVDs out there – a breath-led practice where gentle was the new advanced. 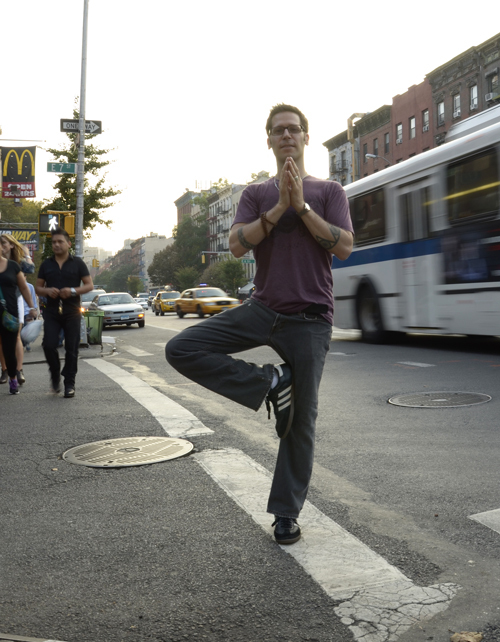 It’s a far cry from where J.’s yoga practice began – he started with an Ashtanga, power vinyasa style. At the time, the intensity suited his struggling temperament. But after sustaining several injuries, J. moved on to explore an Iyengar based approach to learn better alignment and hopefully heal his body. However, even better alignment alone didn’t give him the answers or results he was looking for. Finally, after travelling to Rishikesh in India, J. found a rare and special teacher in Swami P. Saraswati. He taught J that yoga practice was not a linear progression towards some unknown thing, but rather a process of learning how to take care of yourself. Back in NY, J. stopped going to regular group classes and devoted himself to self-practice, ultimately meeting his most influential teacher Mark Whitwell and finding his way to an entirely therapeutic orientation in the tradition of TKV Desikachar and T Krishnamacharya, the “teacher of teachers”. Watched our interview below where we talk about the three sensibilities that shape our yoga practice, why no pain no gain doesn’t work, the state of yoga in the West, how our practice needs to change as we age and what our practice is ultimately all about. I hope you enjoy watching as much as I enjoyed speaking to J.! J. 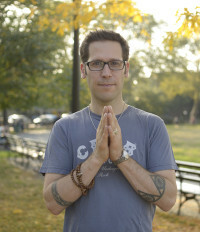 Brown (E-RYT 500) is a yoga teacher, writer, and founder of Abhyasa Yoga Center in Brooklyn, New York. A teacher for 15 years, he is known for his pragmatic approach to teaching personal, breath-centered therapeutic yoga practice adapted to individual needs, including chronic or acute conditions. His writing has been featured in Yoga Therapy Today, the International Journal of Yoga Therapy, Elephant Journal and Yogadork. 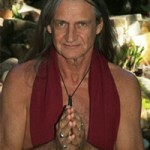 J’s writing, video, and international events are featured at jbrownyoga.com. He is studied in the Ashtanga-Vinyasa, Iyengar, Sivananda, and Desikachar/Krishnamacharya forms of Hatha Yoga practice. His teachers include Alison West (Yoga Union Certified), Richard Freeman, Swami P. Saraswati (Rishikesh-India), Katchie Ananda and Mark Whitwell (Heart of Yoga Certified). You can watch more video blogs from J. here.